Tamoul Quakhaan is a Library Supervisor 1 / Training and Development Assistant in the Human Resources Department and a participant in Cohort 1 of the Skills for Community-Centered Libraries Trainings. After participating in the Skills for Community-Centered Libraries training series, I developed Go Digital! This project gave me the opportunity to practice program planning, document creation, delegation, meeting planning, and program facilitation skills. 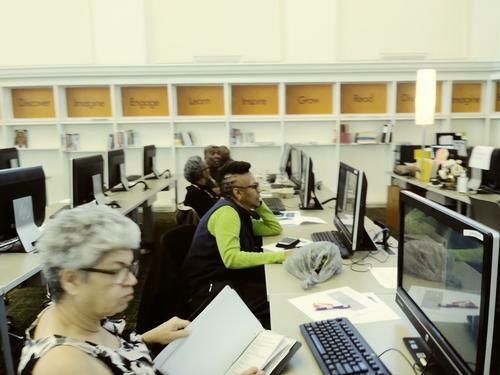 First, many patrons are largely unaware of the free access to subscription based resources offered by Free Library of Philadelphia. These resources contain employment skill-building and life-long learning. These resources that guide learning, advance literacy, and inspire curiosity are available 24/7 on the Free Library's website under Databases. Second, while subscription databases are available through YouTube and LinkedIn, access is limited to those who have internet-connected devices and fee-based memberships to subscription sites. The Free Library offers subscription database services such as Lynda.com and Universal Class to all libary cardholders at no cost. City-wide access to these learning resources has the potential for a deeper impact in our communities. By demonstrating to our communities the ease of access to high quality online learning resources, the Free Library takes one step closer to meeting our vision of an enlightened community devoted to lifelong learning. 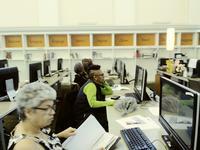 I hosted a series of database demonstrations to raise awareness of the Free Library's online resources. I presented the demonstration at Widener Library, Lillian Marrero Library, and to the members of the World Builders Writing Workshop at Parkway Central Library. Community Initiative Specialist Shahadah Abdul-Rashid helped me create a community interest survey to find out what topics people were interested in. With the survey data and a discussion at the beginning of the demo, I was able to tailor each session to the interests of the attendees. Byron Jackson of PhillyCam filmed the demonstrations and marketed the program over the radio. The next Go Digital! demonstrations will be at People’s Emergency Center on May 15 and June 12. Great job Tee! Thanks for spreading the word! Excellent work Tee! We need to partner.